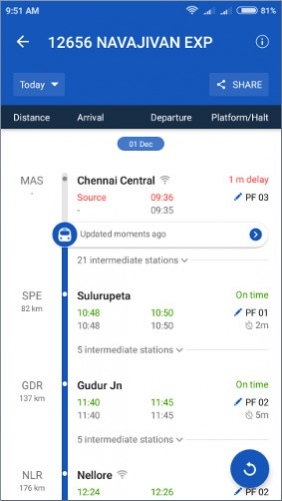 If you are traveling to India for the first time and have no knowledge of the train schedule there then this app can prove to be a lifesaver for you. IRCTC Train PNR Status, NTES Rail Running Status is a useful app which allows you to book train tickets, flights, hotels, and even buses and cabs. It lets them find out which trains are currently available and informs them of their status as well. With this app in hand, you can easily search for trains and determine which one would take you to your destination in the shortest possible time. 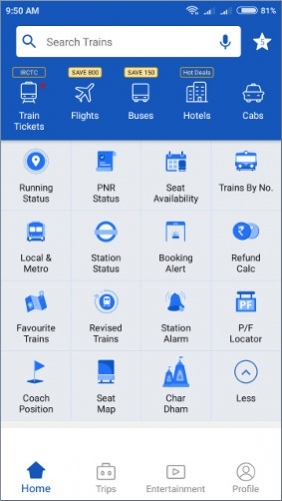 Thanks to its user-friendly interface and simple design and layout, using this app for booking train tickets is an easier proposition for one and all. IRCTC Train PNR Status, NTES Rail Running Status only offers details about the train schedule in India. No matter where in India you are, you can use this app for finding a train that can take you to the place you want to go to. Aside from finding available trains, you can also check which seats are available for you to book in each train too. This app provides real-time information of the number of seats that have been reserved and which ones are up for grabs. There are various filters on offer that can help you in locating the seat that fits your needs and budget. After finding your choice of seat, you can book your ticket via the app by following a simple and secure booking process. Aside from informing you about the train schedule, IRCTC Train PNR Status, NTES Rail Running Status offers updates to you regarding every train. This information can help you in knowing the current location of your train and when it will reach you. Moreover, it also offers reviews for each train which are submitted by people who have traveled in them in the past. These reviews help you in knowing whether the train arrives on time or not and what its speed and other services are like. You can also search for any train you are interested in and find out which routes it serves. There is a search bar provided for this purpose which can help you locate trains both by their routes as well as their numbers. IRCTC Train PNR Status, NTES Rail Running Status doesn't just let you book train tickets. It also provides you the opportunity to book flights from any city in India too. You can find flights at discounted rates from various local and national airlines. Similar to booking train tickets, the process for booking flights is very straight-forward and won't take much time for you to complete. There are also hotel deals provided by this booking app which enable you to find a suitable place to stay during your visit. You can also book bus tickets and call cabs using this app. IRCTC Train PNR Status, NTES Rail Running Status is an app which is marketed towards Indians who frequently travel by train. It enables them to not only check the availability of seats in any train of their choice but also book them without having to visit the station in person. It is a must-have app for tourists visiting India who are interested in knowing about the country's train schedule.